Karma is a term that gets frequently bandied about – a friend steals your ice cream and then steps in dog poo: instant karma! – and is often personified as an external omniscient power that delivers a reckoning or reward depending on our personal balance sheet of good or bad deeds. Yes….and also no. Yes, karma is all about our actions. Yes, there are consequences to these actions for which we are accountable. But karma doesn’t act like a bank where you can save up your good turns to trade in for something less pleasant, nor can you pay off a debt of unkindness by going through the motions of seeming philanthropy. When we act in a way that is not in alignment with what we know in our hearts to be right and true, we make our own karma. These acts form the layers that separate the person we are at centre from the person we are in the world. The more karma we create for ourselves, the more distance there is between the two; we are further from living in our true nature and so we suffer more. We reap what we sow. If karma is an unseen force, it is the part of ourselves that knows the truth that we would never let others see. It is the part that holds us fully responsible against the benchmark of our own standards of decency and morals. And if you know, deep down, that something you’ve done wasn’t quite for the right reasons, like that time you told your mate she should wear that hideous dress so that you would look good next to her, then it will be that part of you that knows the truth that will do the reckoning for you as you continue to live out a pattern that separates you from your highest self. What karma asks of us is that we live up to our highest ideals, and if we fail to do that in the service of our own desires and ego, then it will be our life’s work to shed the layers of karma and break out of the cycle of selfish motivation in order to fully realise ourselves. According to the laws of karma, if we haven’t managed this by the end of this lifetime, we will be reborn again and again to face the same challenges until our karma is dissolved. Pretty heavy stuff! But although karma can seem like a life sentence on the one hand, yoga offers it as one of many paths to liberation. Karma is very closely linked to dharma, our life purpose, or rather our duty to fulfil in this life. We cannot avoid our dharma, it will impel us to act and it is how we act in our dharma that determines our karma. But our dharma may not be entirely in line with the accepted way of things. For some people, acting in accordance with their dharma will require great strength of will and conviction to stay true to their path and act without recourse to ego. As an example of this, when BKS Iyengar decided to pursue a profession teaching yoga he was cast out by his family, having brought shame and dishonour upon them by this choice. Knowing that his dharma was a greater cause than his own desire for approval and inclusion, Iyengar persevered and died having guided countless people along their own path toward liberation. The path of karma yoga, the path to liberation from our karma, requires us to give up our attachment to the consequences of our actions, insofar as they are directed toward our own advantage. Or more simply, stop making it all about you! Once we stop worrying about how things might affect us and acting in a way that attempts to control the outcome, our actions can instead be governed by goodwill and compassion toward others. Once we get out of the way, the action itself is the focus, and the intention with which it is done can be in service to a greater cause, irrespective of the consequences. Or, as Gandhi put it when summing up his life, ‘Renounce and enjoy’! Ultimately, all karma asks of you is that you truly live by your own deepest truth. Often the language that goes around this can appear quite passive; surrender, relinquish, let go of the fruits of your actions, of your ego and self-centredness. But when we see examples of people holding themselves fully accountable for their actions, staying firm on the path of their dharma and fully living their karma yoga, what we see is people being strong and holding steady in what they know to be right and true. These examples often wield the power to change the karma of mankind, to put us all on a better path, shifting what is normalised to something that is closer to the truth of things. So how can we mere mortals practice our own karma yoga? Simply by getting out of our own way. 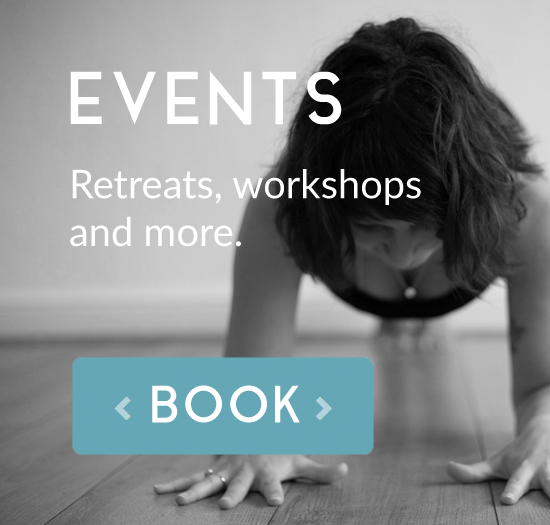 On the mat, by staying in our own practice and our own journey, being present as much as possible and not being motivated by wanting a certain outcome; to nail the pose, to compete with the person next to us, to be the best or to achieve a so-called ‘rockin’ yoga body’ (you can keep that one DailyOm)! Off the mat your selfless actions might include giving to charity, listening to someone with great compassion, or giving your time to a cause that you don’t stand to benefit from directly. Of course the intention with which any action is performed will be the measure of it, so something as simple as taking someone else’s plate to the kitchen can be an act of karma yoga. As Krishna reassures Arjuna in the Bhagavad Gita, ‘On this path no effort is ever wasted, and no gain ever reversed’.